I uploaded this to my web page today, it maybe of interest. Edited by J. C. Beaglehole. The Trustees of the Public Library of New South Wales in Association with Angus and Robertson, 89 Castlereagh Street, Sydney. First published February 1962. Second Edition 1963. Two Volumes. The following details have been largely collated from Robson (2000). This is a unique work with a wealth of information in the form of maps, providing a wonderful geographical context to Cook's voyages that is simply not possible from written accounts. James Cook R.N. -- James Cook lead three scientific and exploratory expeditions to the Pacific Ocean for the British Navy, from 1768 to 1780. His achievements were considerable. The first voyage (1768-1771), in the Endeavour, recorded the transit of Venus from Tahiti, circumnavigated New Zealand and established the extent of the east coast of Australia. This largely disproved a prevalent theory, Terra Australis incognita, of a massive southern continent -- ostensibly to balance those of the northen hemisphere. The voyage was expertly recorded (note Cook's superb mapping techniques) and returned a huge collection of cultural and botanical specimens - these were also features of the subsequent voyages. Joseph Banks -- Joseph Banks was an English arisocrat with an inexhaustive appetite for the accumulation of scientific knowledge characteristic of the Age of Enlightenment. He personally funded his party's passage aboard the Endeavour and, with his associate Dr Solander, was largely reponsible for the massive amount of botanical and cultural material that was collected. Bank's description of surf-riding is rich in detail and typical of his scientific approach, however he appears not to have questioned the riders about their activity and the exact nature of the craft ("stern of an old canoe") is difficult to determine. Although the report was not available in print until 1962 (? ), the activity was witnessed by other members of the expedition and it would seems improbable that this "strange diversion" was not later a topic of dicussion at the captain's table. Cook was later to record canoe surfing on his return to Tahiti in 1777, and the third voyage recorded the first European account of Hawaiian surf-riding and the first image of a surfboard by John Weber. "Sometimes they were carried almost ashore but generaly the wave broke over them before they were half way (13), in which case the[y] divd and quickly rose on the other side with the canoe in their hands (14), which was towd out again and the same method repeated (15). We stood admiring this very wonderfull scene for full half an hour, in which time no one of the actors atempted to come ashore but all seemd most highly entertaind with their strange diversion. (16)"
Given that this was the first sighting of surf-riding, it is highly unlikely that the report would employ terminology that corresponds with contemporary use. Furthermore, the report appears to have no information contributed by Tahitians. As indicated by the text, Banks certainly did not talk to this group. Lt. Cook, Dr. Solander, Banks and several midshipmen set out from Fort Venus, Matavai Bay in the pinnace on the morning of the 28th May 1769 and headed east. After approximately six miles, Cook decided to beach the boat and the party continued on foot. After an overnight stay they returned to the pinnace on the 29th May. The surf-riding activity was observed from shore and probably by all members of the party. I have not been able to identify a possible location for the report. Notes the lack of the outside reef, allowing substantial swell to break close to shore in conditions percieved by Banks to be extremely dangerous. In contemporary surf-riding terminology, this manourve is known as a 'duck-dive" and was first illustrated by Wallis McKay, circa 1874. The craft was propelled (and, we assume, ridden) in a prone position with arm (and possibly leg) power and did not use bladded paddles. From the take-off zone, maximising the wave height and the length of ride, and sometimes "they were carried almost ashore". The "get into it" is problematic and there is no reference, as might be expected at this juncture of the narrative, to the substantial difficutlies of achieving successful take-off. Apparently these Tahitian surf-riders were highly proficient in this skill. A variation on a manourve known as an "Island Pull-out", it indicates the importance of securing the craft in difficult conditions. A continous process of wave riding followed by paddling ("towd") back out through the surf. I, like most other commentators, had peviously assumed that the fisrt Eurpean account of surf-riding was by James Cook and James King in Hawaii in 1779. Following intensive online discussion in assessing the historical value of a newspaper account and image purporting to record an Hawaiian female board rider in New Jersey in 1886 (? 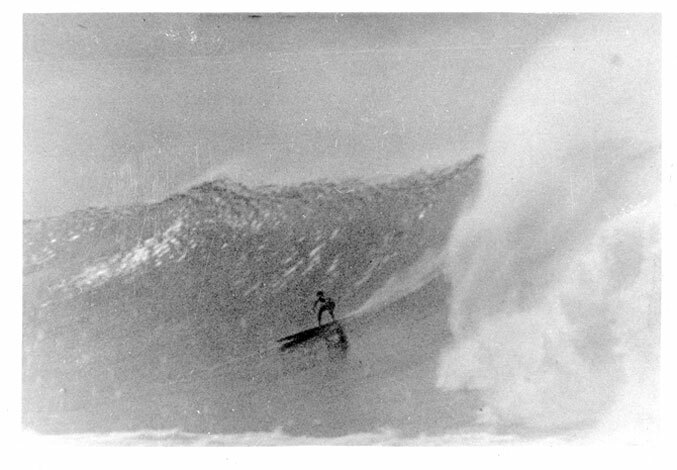 ), I extensively revised all my sources of early surf-riding accounts and images. I also revised the commonly available accounts of ancient surfboard construction. My initial conclusion was that these were incomplete, derivative and possibly misleading. I then attempted to source documents relating to Polynesian carpentry. On 3rd July 2006, while browsing my local library for books on early Christian history, I pulled Donald A. Mackenzie's South Seas : Myths and Legends (1930/1996) from the shelf (Dewey : 291.13 MACK). I had previously examined a copy of this book (provided by John McInnes, who noted the dramatic cover illustration of canoe-surfing) but was unable to date the illustration or detect any relevant data for my research. The second copy (literally ?) fell open at page 7 - Joseph Banks' account of Tahitian carpentry, circa 1770. Attached below. Unfortunately the only reference for the quotation was E. Best, The Stone Implements of the Maori, Bulletin No. 4, Dominion Museum, Wellington (N.Z.) 1912, pp154 et seq. I immediately went to Mr. Geoffrey Hadrill at the Reference Desk, detailed my problem to and was delighted to be provided from the stack with Banks' Journal in Two Volumes (1963). That evening I searched Banks and located the quotation (entered on 14th August 1769) on pages 363 -364. Satisfied with this discovery, I retired for the evening but continued to browse Bank's Journal.. Twenty minutes later I read Banks' account of Tahitian surf-riding of 29th May 1769. Too excited to sleep, I booted up the computer, ran the relevant sections through the scanner OCR program and began to compile this entry. This took several hours and I was able to get to sleep sometime after 3.30 am. "the botanist Joseph Banks described the first recorded instance of ‘surfing’ in his journal." http://www.herriotcountry.com/content/captaincook/captaincook.php -- The report is linked to a dated entry (29th May 1769) that both paraphrases and directly quotes Banks' account. 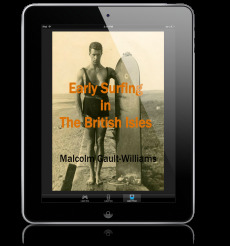 Further online searches located only one other report - without references and clearly contentious... "The origin of surfing is Polynesian, although this sport became more popular further North, in Hawaii. Explorers' stories, particularly Cook's, already mentioned this sport practiced by the Maohis in 1767 (sic. Cook's first voyage left England in August, 1768), while laying on a board: it was the ancestor of body boarding. (it was only in the early 20th century than some American had the strange idea to stand up on the board.)" On the 9th July 2006, this page was uploaded to surfresearch.com.au and copies forwarded by email to Chris Jones, Peter Robinson and others. More information and detail can be found here: "Joseph Banks: Surf-riding in Tahiti, 1769"